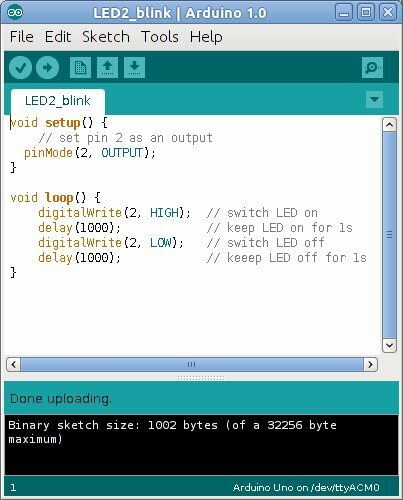 In this tutorial, you will first load a program to the Arduino Uno board that will flash the on-board LED on and off. 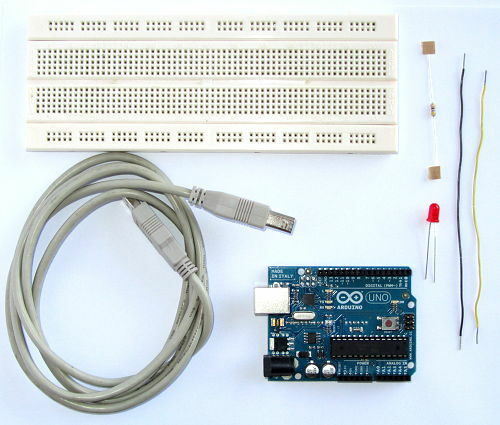 You will then connect an external LED to the Arduino using a breadboard and load a new program to flash the external LED on and off. How to set up and program the Arduino. How to interface (connect) an LED to the Arduino. First complete tutorial 1 before attempting this tutorial. Although not essential, it is also recommended to complete tutorial 2. You basically just need to download and install the Arduino IDE software as described below, but rather refer to the step-by-step installation instructions on the Getting Started with Arduino web page - click the Windows, Mac or Linux link on this page. 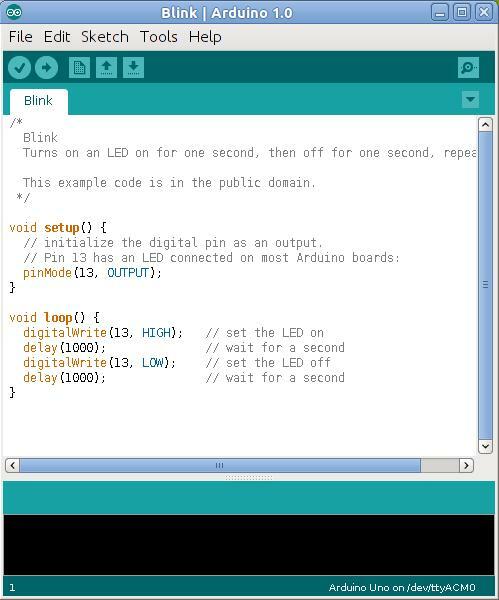 Windows: Download the latest version of the Arduino IDE from the Download the Arduino Software web page (click the Windows link). Unzip the downloaded file and extract the contents to a folder in a convenient location – e.g. to your desktop. Install the drivers as described on the Windows getting started page. To run the Arduino IDE, open the folder and double-click the arduino icon. Ubuntu Linux: Install the Arduino IDE from the Ubuntu Software Center. For other Linux distributions and information on installing the latest version, see the Linux link on the Getting Started with Arduino web page. If you have installed an older version of the IDE from the Ubuntu Software Center, then all of the dependencies will be installed. To use the newest version of the IDE, download the Linux edition from the Download the Arduino Software web page. Unzip the downloaded file and extract the contents to a folder on your desktop or home folder. To run the IDE, open the folder and double-click the arduino icon. Click the "Run" button in the dialog box that pops up. We will initially program the Arduino board with a program that is built into the Arduino IDE. This program will flash the on-board LED on and off. Plug the USB cable into the Arduino USB connector and the other end into a spare USB port on the PC that you loaded the Arduino IDE to. Make sure that you have selected the correct board and serial port as described in the in the installation instructions. A new window will open showing some program code as shown below. Click the Upload button (shown in red below) on the top toolbar to load the program to the Arduino. The program should load and then start running - you will see the LED marked 'L' on the board start to flash on and off. We will now interface an external LED to the Arduino board. 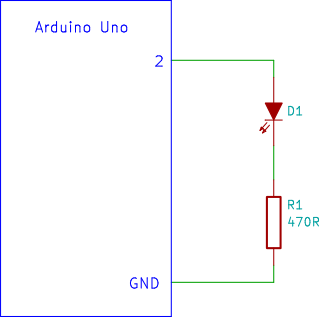 The circuit diagram below tells us to connect the anode of the LED to pin 2 of the Arduino board. Pin 2 is marked on the silk-screen of the board. The LED cathode connects to a resistor and the other lead of the resistor connects to one of the GND pins of the Arduino (the Arduino Uno has three pins marked as GND, use any one of them). Bend the longer lead of the LED out and down and then plug the LED into the breadboard. Plug the 470 ohm resistor into the breadboard so that one of its leads connects to the cathode (shorter lead) of the LED. Connect the other lead of the resistor to one of the GND pins of the Arduino board using a long wire link. Connect the anode (longer lead) of the LED to pin 2 of the Arduino using a long wire link. The new program is an adaptation of the previous program. It has been modified to flash an LED on and off that is connected to pin 2 of the Arduino. Start the Arduino IDE and either type the following program (from the screen-capture below) into the IDE and save it, or select the code below and then copy it and paste it into the IDE. In the Arduino IDE, save the program that you typed or copied and pasted. Click the Verify button on the top toolbar of the IDE to make sure that the program has no errors in it (the verify button is the first icon on the toolbar - the tick mark). If the program has any errors, then make sure that you typed the program in exactly as shown. Make corrections, save and verify again. Click the Upload button to load the program to the Arduino board. After the upload completes, the external LED interfaced to pin 2 of the Arduino board should start to flash on and off just like the on-board LED did after loading the first program.